Barracks Row restaurant for New American cuisine. : Though you may have to wait for a seat at this Barracks Row destination, once inside, the attentive servers will bring your menu and deliver drinks and orders in record time. What may slow you down, however, is decision making, which can transpire while you consume the hot yeast rolls complemented by honey and butter. Start with the drink combining blanco tequila, agave and a jalapeño punch. Then it’s on to the small dishes that have included thin slices of raw tuna with fresh wasabi dabbed on the side, and an esoteric salad that pairs crumbled sausage with lychee and a coconut drizzle. 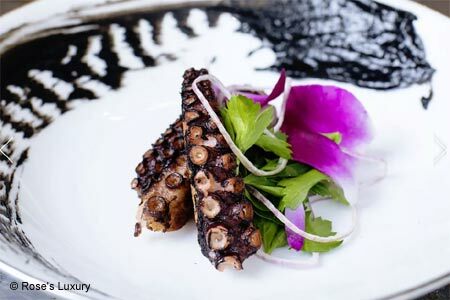 If it’s available, snap up the grilled octopus, presented in a mound as seasoned and crispy pieces. The kitchen turns out two family-style entrées, portions to accommodate three to four people --- think thick slices of smoked beef brisket with a ramekin of horseradish and some slaw, plus toast. While many of the savory offerings are relatively straightforward, the desserts are a curious mix of eclectic and experimental. Consider a dish of foie gras french toast with cinnamon toast ice cream, or the tiny slice of English pea cake with a minty curd and a sprinkling of pistachios. Chances are high that few patrons will recognize the main ingredients, so converted are they into something very different. Note that the limited wine and beer menu does propose some unique labels. The space comprises the noisy up-front area, the chattering mid-section near the kitchen, and the quieter alcove at the rear, shielded with wooden walls and a ceiling strung with lights.